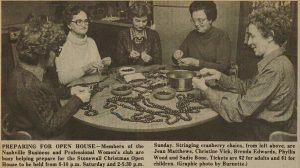 Nearly a dozen new scrapbooks from the Nashville Business and Professional Women’s Club are now digitized and online at DigitalNC, courtesy of our partner, the Harold D. Cooley Library in Nashville, NC. A 1981 clipping from the Nashville Graphic about the Nashville BPW setting up for the Stonewall Christmas Open House. 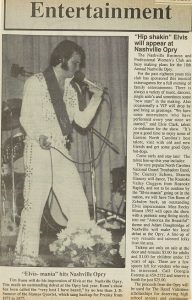 One clipping advertising the Nashville Opry, put on by the Nashville BPW, featuring an Elvis impersonator Tim Bunn. Chartered in 1921, the National Federation of Business and Professional Women’s Clubs was designed to promote the professional and business interests of women, extend professional opportunities to women, “elevate the standards for women”, and more. This batch includes the articles and bylaws of incorporation for the BPW Club, as well as over 12 years of scrapbooks for the group. Inside these scrapbooks are documents, photos of members and of state conventions and functions, newspaper clippings about local events, and newsletters all about the clubs and its members. Having this material on our website is crucial to preserving information about social clubs and increasing representation online. To see more materials from Harold D. Cooley Library, please check out their contributor page or visit their website.